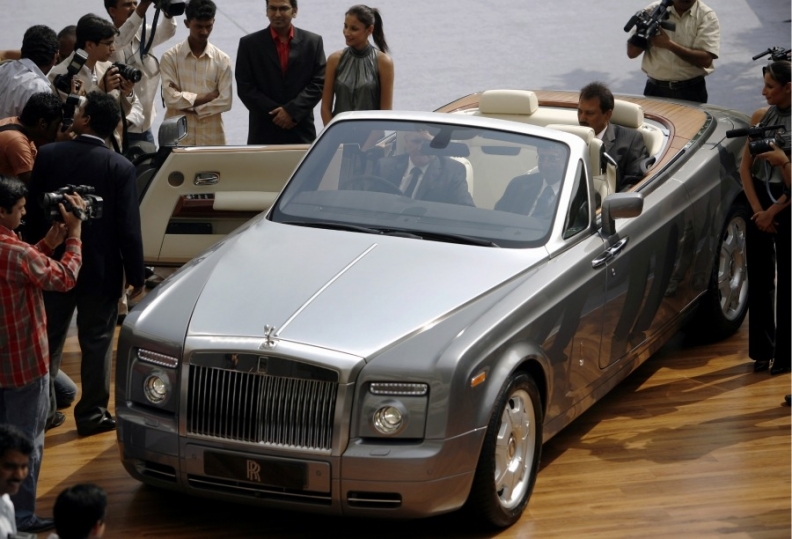 The Rolls-Royce Phantom Drophead Coupe seen at its launch in Mumbai. MUMBAI – Bentley and Rolls-Royce are aggressively targeting India's richest 0.01 percent in a drive to grow sales in an historically important country for the luxury British brands. Volkswagen Group's Bentley will announce this year plans to increase dealerships in the country, its second most important Asian market after China, said Amy Arora, brand director at distributor Exclusive Motors. BMW-owned Rolls-Royce may triple its number of showrooms this year to six in India, home to the youngest person to ever buy a Ghost sedan, which starts at 29 million rupees (427,000 euros, $570,000). While the World Bank estimates the majority of Indians live below the poverty line, investment group CLSA Asia-Pacific estimates the number of millionaires will surge to 403,000 by 2015 from 173,000 in 2010. "India's new rich are looking to get a car that's different from the now-common Mercedes and BMW," said Deepesh Rathore, managing director for analysts IHS Automotive in India. "Growth at the top of the pyramid is much faster than at the bottom and so we'll see many more millionaires rising in India." Bentley sponsored this month's Indian Masters tournament of polo – the pastime of the nation's Maharajas a century ago – as part of its push to attract the nation's elite, Arora said. The company, which has dealerships in New Delhi and Mumbai, is looking to expand into Hyderabad and Chennai next year, Arora said. Rolls-Royce, which promoted its cars in the Maharaja of Jodhpur polo tournament, said its ties to India's former royals run deeper. In the 40 years leading to India's independence in 1947, Maharajas ordered the bulk of the 1,000 Rolls-Royces shipped to the country, making India one of the company's biggest postwar clients, according to Herfried Hasenoehrl, the company's head of business development for India, Sri Lanka and Bangladesh. The number of superluxury cars – including Ferrari, Aston Martin, Lamborghini, Bentley and Rolls-Royce models – sold in India will jump to about 800 by 2020, compared with 180 last year, according to IHS Automotive. "Ultraluxury cars are aspirational products and they come with social recognition," said Lalit Choudary, director at Performance Cars, which distributes Aston Martins in India. "With the global economy picking up, sales have picked up." According to the latest World Wealth Report from Merrill Lynch and Capgemini, India's pool of high-net-worth individuals – those with at least $1 million of investable assets – grew the fastest among the dozen countries with the most millionaires during 2010. Among them was a 24-year-old who became the youngest customer to purchase a Rolls-Royce Ghost, according to Hasenoehrl, who declined to identify the buyer. "Rolls-Royce has an extraordinary relationship with India; in fact, we affectionately see it as something of a second spiritual home," Hasenoehrl said. Rolls-Royce, which has dealerships in Delhi and Mumbai, plans to add a showroom in Hyderabad in the third quarter and Chandigarh the following quarter, Hasenoehrl said. The company may add two more this year depending on negotiations with potential partners, he said. While the company doesn't break down India sales, the country has the company's second-largest number of dealerships in Asia Pacific after China, Hasenoehrl said. Globally, deliveries of Rolls-Royce cars jumped 31 percent to 3,538 cars last year, beating the previous record set in 1978 by 191 vehicles. China became its biggest market in 2011, three years ahead of schedule, according to the company. Bentley, which expects China to become its biggest market this year, reported global vehicle deliveries rose 37 percent to 7,003. Arora declined to give India sales figures. The more mainstream luxury carmakers – Mercedes-Benz, BMW and Audi – are also gaining. Growth in deliveries of premium vehicles in India will climb 32 percent to 161,000 units next year, surpassing Russia and Spain, according to estimates at Goldman Sachs Group this month. While India's affluence may have expanded alongside the economy, which has grown sixfold since 1993 and now ranks third in Asia behind China and Japan, the trend in vehicle sales also illustrates the nation's widening wealth gap. Total car sales may increase between 0 percent and 2 percent in India during the year ending March 31. That would be the slowest growth in nine years, as the highest interest rates in more than three years dampen demand in a nation where almost 80 percent of cars are bought with bank loans, according to the Society of Indian Automobile Manufacturers. According to IHS's Rathore, demand for superluxury cars may be immune to slowing economic conditions thanks to another burgeoning trend in India: vanity. "In the past, people did not want to show off their wealth, as it attracted attention," Rathore said. "Today, people have the wealth and don't mind spending it, and are no longer hesitant about showing it off."